Bluetooth Smart Watch with Camera Touch Screen Smartwatch Unlocked Watch Cell Phone with Sim Card Slot Smart Wrist Watch Fitness Tracker for Android Phones (Black) by Unknown at DJ Luu. Hurry! Limited time offer. Offer valid only while supplies last. Features - Built-in Camera, Message Reminder, Call Reminder, Answer/ Dial Calls, Remote Camera Control, Push Messaging, Anti-lost, Pedometer, Sleep Tracker, Calendar, Calculator, Alarm, Audio Player & Many More! Health Monitoring - Conveniently take control of your health using the watch for features such as; sleep monitor, Step counter, Calorie Counter, Drink Water Reminder & more! Sim Card Slot - Browse the web and connect with friends on apps such as Face book, Twitter, Whatsapp & more by simply inserting a sim card (Not Included) into the smart watch. 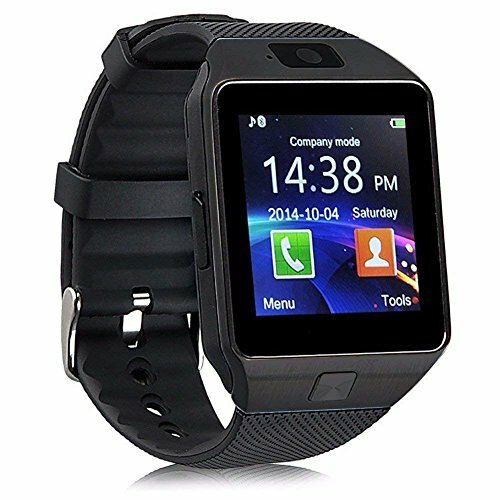 Although this is not needed as the watch is Bluetooth compatible, inserting a sim essentially turns the smart watch into an independent android Smartphone. Functions for Androids - Downloading the APK app on your android phone allow you to enjoy the full functionality and features of the DZ09 Smart watch. Features include; Answer Calls, Dial Calls, Contact Sync, Audio Player, Camera, Calculator, Calendar, Alarm, Sedentary Reminder, Anti-Lost, Push Notifications, Text Messaging, Sleep Monitor, Pedometer (Step Counter), Calorie Counter and Remote Camera Control.